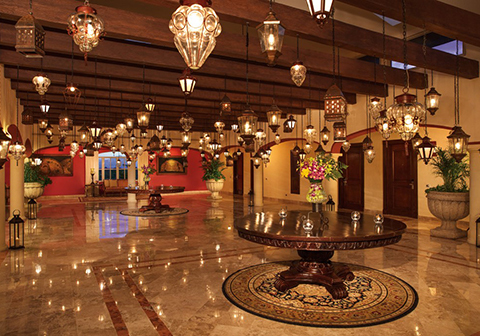 Secrets Capri Riviera Cancun, an all-adult, all Preferred Club, AAA Four Diamond resort in the Riviera Maya, offers guests extra attention with its unique, concierge-style setup. Intimate, villa-style surroundings set the tone for achieving ultimate rejuvenation and were designed to inspire the experience-seeking traveler. 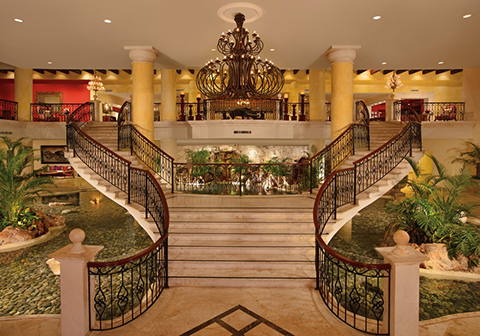 Guests are treated to elegant accommodations, styled with enhanced Preferred Club amenities and Mediterranean-inspired décor. 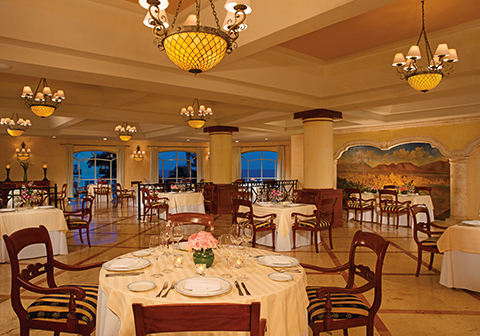 Savor international cuisine at five gourmet restaurants and delight in health-conscious meal options, including gluten-free, sugar-free, vegetarian and organic selections. 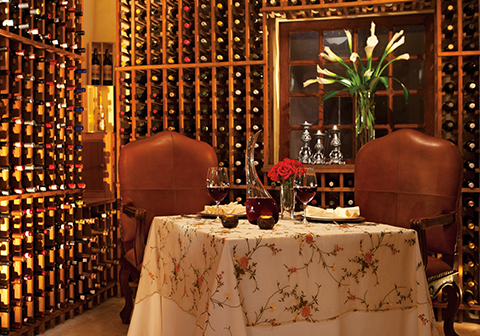 Enjoy complimentary greens fees at a nearby championship course, stay entertained with live performances, themed dinner and shows, partake in a digital photography class, unwind at the Secrets Spa by Pevonia®, or spend a night out at a nearby participating resort with the Sip, Savor & See Dining Experience. 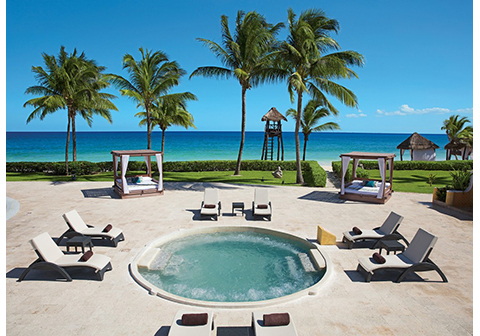 The Unlimited-Luxury® journey continues with on-site cultural experiences, enriching classes and complimentary Unlimited Connectivity – a new way to stay in touch at the resort with free Wi-Fi, free calling to the U.S. and Canada, and more. 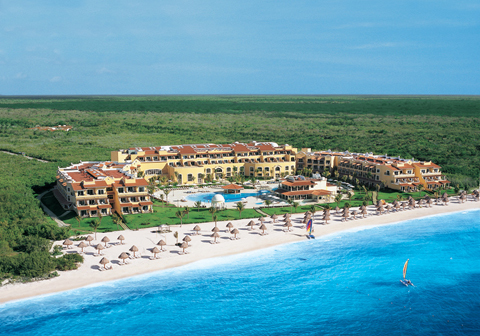 Secrets Capri Riviera Cancun – where rejuvenation and enrichment meet intimate charm, all for you. 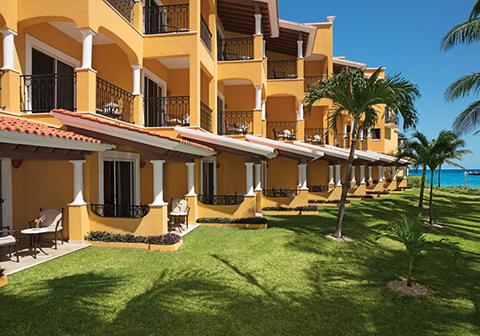 Secrets Capri Riviera Cancun boasts a four story building with 291 luxurious guestrooms and suites that offer the elegance and class of an Italian-style villa while embracing you as a treasured and most privileged guest. 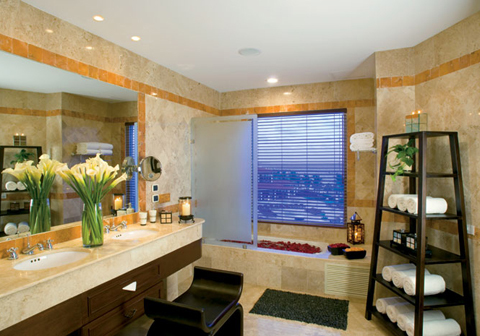 Your comfort is paramount at Secrets Capri with concierge-style service attending to each guest with personalized care and attention. Our guest rooms offering superior amenities that include four-poster canopy king or double beds, private and furnished patio or balcony and full Italian marble bathrooms with a jetted whirlpool bathtub. 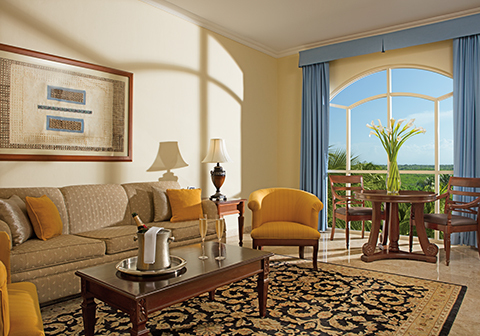 In addition to the above amenities, the Preferred Club Deluxe Tropical View offers fabulous tropical garden views. Located on 2nd and 3rd floors. 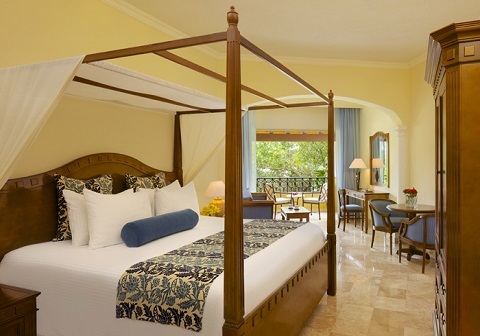 In addition to the above amenities, the Preferred Club Junior Suite Tropical View also features an oversized room with a king size bed and a separate living area. Suites located on the ground floor. 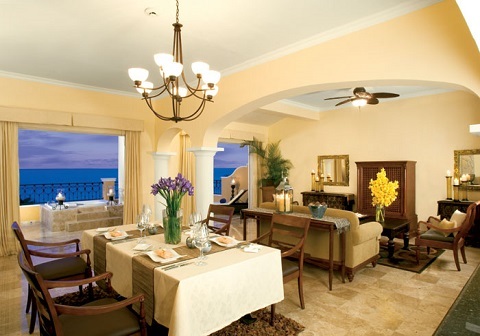 In addition to the above amenities, the Preferred Club Deluxe Ocean View offers breathtaking ocean views. Located on 2nd and 3rd floors. 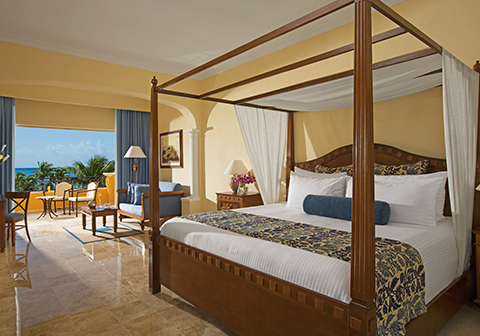 In addition to the above amenities, the Preferred Club Junior Suite Ocean View offers an oversized room with a king size bed and a separate living area. 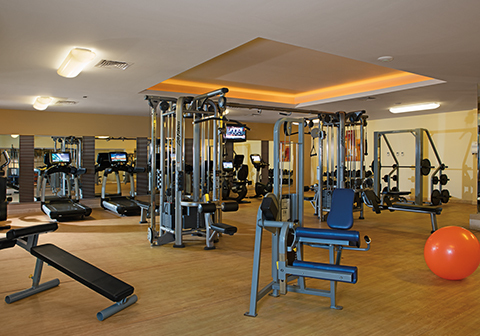 Suites are located on the ground floor and provide easy access to the pool. 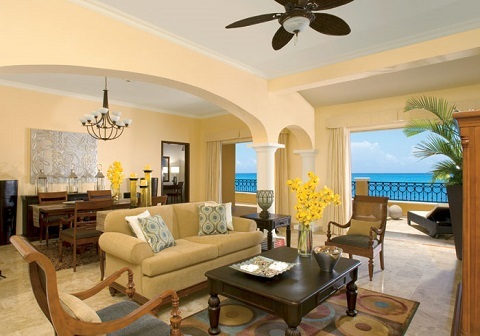 In addition to the above amenities, the Preferred Club Junior Suite Ocean Front offers stunning oceanfront views with private terrace or balcony and oversized room. 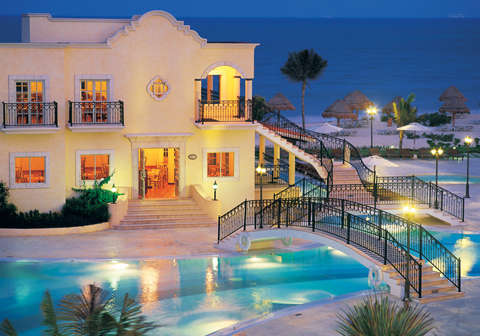 Suites face the beach and provide convenient beach and pool access. Located on 1st and 2nd floors. In addition to the above amenities, the Preferred Club One Bedroom Honeymoon Suite Tropical View offers a private balcony, indoor Jacuzzi for two and separate living room area. Located on 5th floor facing the lush tropical jungle. 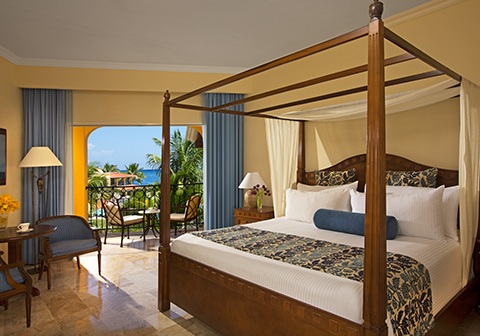 In addition to the above amenities, the Preferred Club One Bedroom Honeymoon Suite Ocean View offers a spacious room, Jacuzzi for two on the private terrace, separate living room area and spectacular oceanfront views. Located on 3rd floor. In addition to the above amenities, the Preferred Club One Bedroom Presidential Suite offers a separate living room area, separate dining room plus kitchenette and expansive private terrace with Jacuzzi for two. 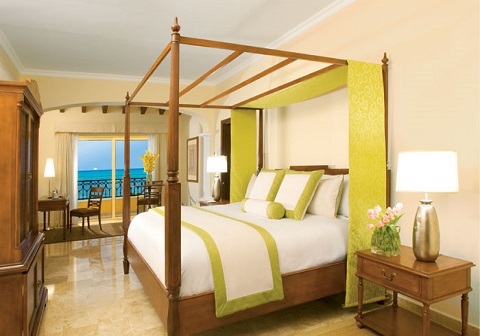 Also features a main bedroom with king bed, luxurious bathroom and stunning oceanfront views. Located on 3rd floor. 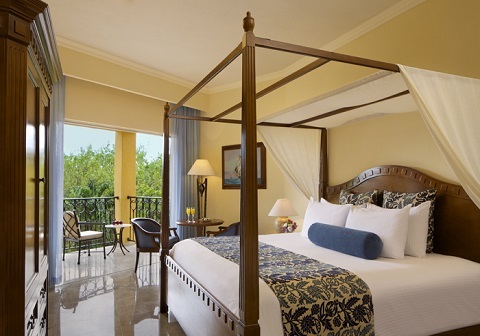 2 ADA rooms in the Preferred Club Junior Suite Tropical View category: two double beds, oversized bathroom door, handrail in shower and water closet, bath and shower chair, no bathtub, lower mirrors, peephole and towel hanger, ramp on terrace. Located in the center tower on the ground floor next to the elevator. Guests may choose from five à la carte gourmet restaurants, a buffet venue and a café, as well as 24-hour café room service. All restaurants openings rotate throughout the week. 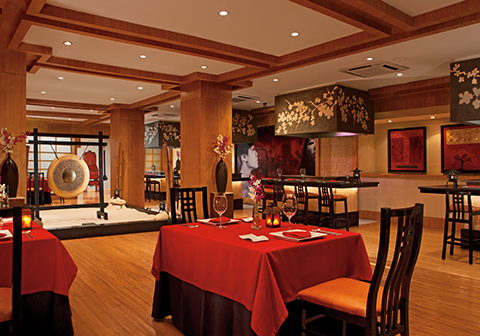 24-hour dining options allow guests to enjoy late night bites at Coco Cafe. Or guests can stay in and order room service. It’s all available at any hour day or night. Note: Number of restaurants open for each meal is dependent upon occupancy levels. All restaurants are non-smoking; reservations are not required. 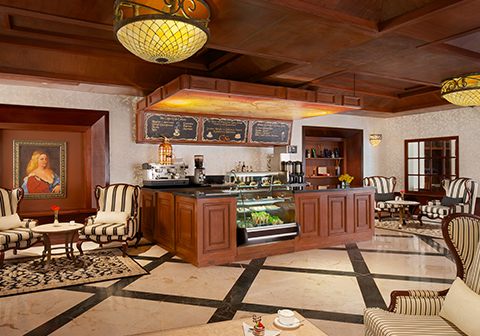 Cactus Club Ceviche & Taco Bar | Breakfast 8:00 a.m. – 10:00 a.m., Lunch 11:00 a.m. – 5:00 p.m.
La Riviera | Breakfast 7:00 a.m. – 11:00 a.m.; Lunch 12:30 p.m. – 3:00 p.m.; Dinner 6:00 p.m. – 11:00 p.m.
Seaside Grill | Lunch 11:00 a.m. – 5:00 p.m.; Dinner 6:00 p.m. – 11:00 p.m.
Offering 4 bars and lounges serving premium domestic and international beverages and top-shelf spirits. Desires Music Lounge | 5:00 p.m. – 1:00 a.m.
Manatees Bar | 10:00 a.m. – 5:00 p.m.
Rendezvous Bar | 10:00 a.m. – 1:00 a.m.
Sugar Reef | 9:00 a.m. – 11:00 p.m.
As part of the privileges of Unlimited-Luxury®, we’re offering guests of Secrets Capri Riviera Cancun the chance to Sip, Savor & See all AMResorts properties in the region. 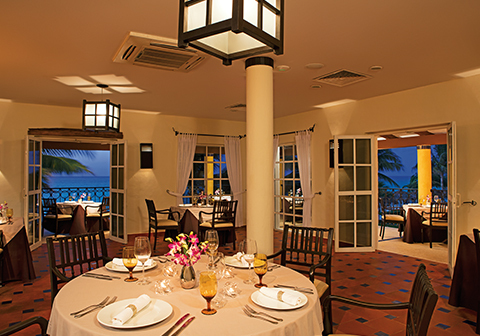 Enjoy dinner and live entertainment at sister resorts including sipping complimentary cocktails, savoring delicious cuisine at the restaurant of your choice and the opportunity to see that evening’s entertainment. 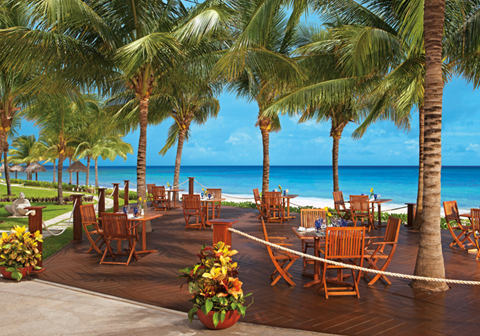 The Riviera Maya region features the tranquility of un-crowded sugar-white beaches, a vast network of underground rivers and the world’s second largest barrier reef. Enjoy a variety of enriching activities including bird watching, trail biking, nature walks, scuba diving and snorkeling and deep-sea fishing. 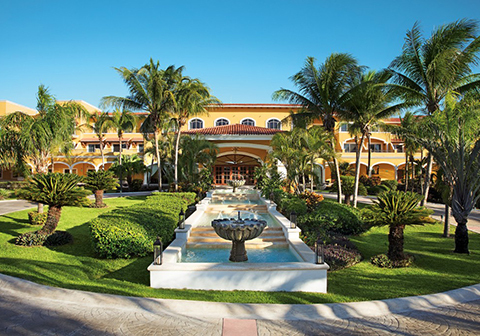 Secrets Capri Riviera Cancun is in close proximity to many of Mexico’s most significant Mayan archeological sites, making it the ideal location for a number of cultural experiences. Our tour desk can help you arrange private or group excursions to wonderful nearby attractions. 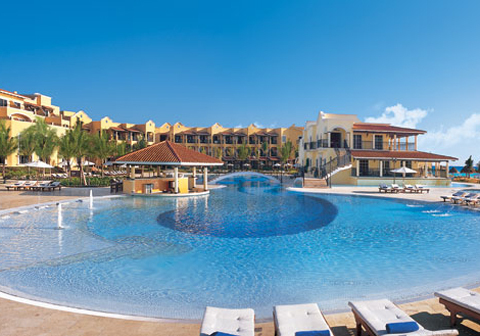 Guests of Secrets Capri Riviera Cancun can enjoy one complimentary round per person, per day when staying now through October 31, 2018. There are additional fees that guests are responsible for at the golf course. Details & pricing can be found on the Special Offers page under “Complimentary Greens Fees” offer. 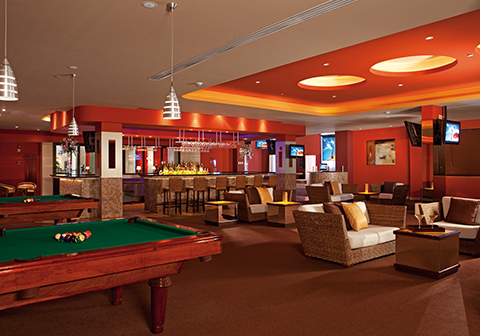 Step inside our luxe members-only U-Lounge at Secrets Capril! You'll get to enjoy special amenities including a lounge area, light beverages and snacks, complimentary internet access, books, DVD rentals and more. Your dedicated Member Services Executive there to help you reserve your Amstar or resort services, make payments or future reservations and so much more! 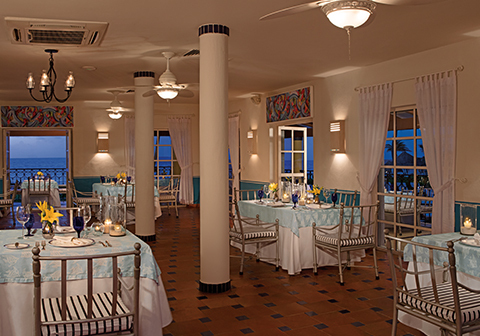 Guests at Secrets Capri can stay connected for free! 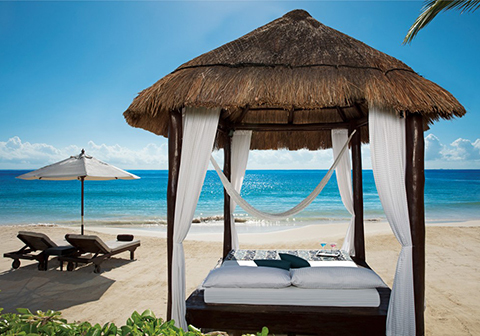 Download the free Secrets Resorts and Spas app on your smartphone, tablet, or mobile device to place calls* and send messages over the hotel’s WiFi network without incurring international cell phone roaming charges. Plus, create user profiles, keep up with social media, use your room phone remotely, contact staff directly, tailor personal deal preferences, book spa appointments, reserve excursions and much, much more. The app makes hotel information mobile – you're only a click away from information about dining, amenities, resort activities, local attractions and more. It's the perfect travel companion that allows you to enjoy your vacation...connected. Learn more about Unlimited Connectivity at UnlimitedConnectivity.com. 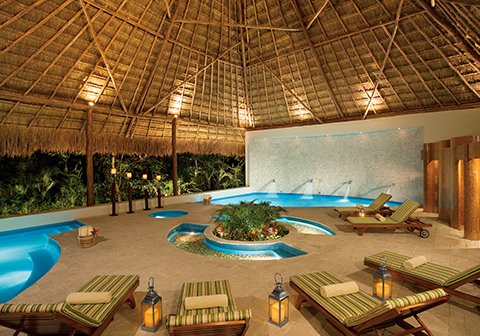 Secrets Spa by Pevonia® stretches over 13,000 sq. 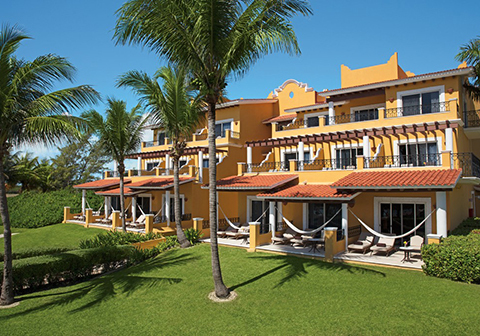 ft., situated among the Riviera Maya jungle. 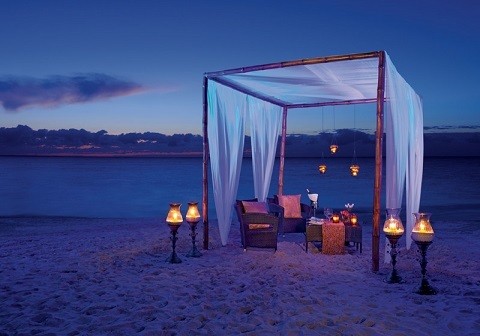 Experience ultimate relaxation and a chance for both physical and spiritual rejuvenation. 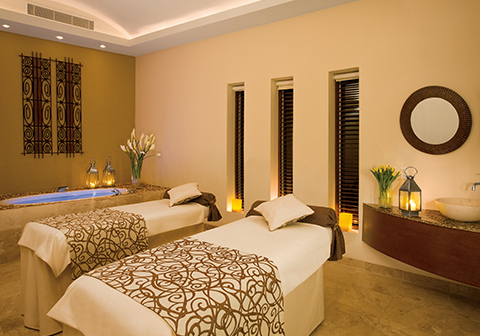 Visit our spa boutique to bring your luxurious spa experience home with you. For those guests seeking a sanctuary for the senses Secrets Spa by Pevonia® offers a sublime atmosphere of pure indulgence combining hydrotherapy and indigenous treatments creating a refreshing, invigorating and peaceful experience. 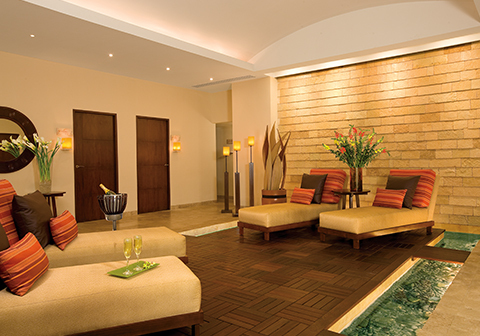 Indulge in your choice of the most soothing, relaxing and result-driven treatments featuring: private showers, Jacuzzi baths and treatment rooms, a relaxation lounge, saunas, steam rooms and private showers are available, as well as pedicures, manicures, facials and a full-service beauty salon.